Aplimentec Foundation received contract with DWASH for implementing Integrated WASH-NRM projects at Sub district Lacubar and Barique, district Manatuto. The program covered 4 villages and 9 sub villages. The contract grant is US$ 131,954.00 for the period of 1 March-31 December 2011. The project activities is included community engagement process, CAP activities, GMF formation, Technical Assessment (WASH-NRM), physical construction and finalization the project. 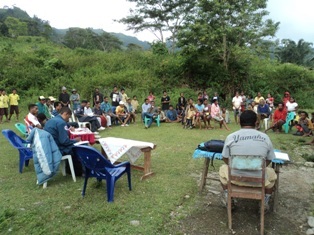 Community engagement process started in 1-30 March 2011 targeted 4 villages and 9 sub villages in sub district Laclubar and Barique. The consultation processes were organized by DWASH team with support from government and local leaders that intended to socialize DWASH main objective, goals and program outcomes. The consultations as well were intended to introduce the NGOs partners for the DWASH implementation programs. Technical assessment and social survey activities were performed during 1-20 April 2011 that covered physical construction, topographical assessment, population figures, location profiles, health assessment and environment conditions. Then, the CAP process was conducted in 27 April to 6 May 2011. The CAP activities include: social analysis activities, CAP review and reports. Inside CAP process, Aplimentec was responsible for GMF’s stabilization in 8 locations. It was completed by the end of CAP process, 2-6 May 2011. Community engagement process was closed by signed of MoU amongst district government (District Steering Committee, Sub district Steering Committee), DWASH and community representative May 2011 that enable community agreement on DWASH program full intervention. Re-assessment on water construction plan was conducted in 8-30 May 2011. The assessment focused on infrastructures assessment, water quality test, and topographical survey. The completion of technical assessment rose technical proposal for water designs system, BoQ and the planning for water implementation project which full involvement of GMF and community members. The physical construction was started in 1 March 2010 in 8 locations inside 4 sub villages. The construction leaded by Aplimentec with a support from DWASH Engineering team, GFM and community working groups. DWASH and Aplimentec Engineering are responsible for technical supervision, mentoring and monitoring. Apimentec main responsible is to manage the community working groups with the supports from GMF in each location. Aplimentec leaded the constructions, manage the food distributions, support the warehouse management, set the timeframe for construction works with GMF, managing the material delivers and update the challenges and progress of the constructions. Training and capacity building for community was performed in two ways such formal training and ongoing training. The formal training is a regular training such: management, meeting, monitoring, evaluation and gender that conducted in regular GMF meeting with a support from DWASH and Aplimentec facilitators’ team. Ongoing training was conducted during physical implementation in fields such technical training on fitting, pipe installation, construction and its future maintenance. Most of the trainings were performed during June-October 2011. Gender was a highest consideration inside all DWASH project implementations. The issues of women participations, gender balance, and capacity building were well performs during DWASH implementation programs. Women almost have opportunity inside GMF structures, meeting, decisions making, working works, project implementation and training. The water physical constructions have reached 100 % of achievement by the end of November 2011 that provided more than 2584 beneficiaries that included 4 villages and 9 sub villages. The projects provide clean water supply for more than 2584 population included healthy sanitation access for 506 households. The projects brought huge impacts on community behaviors and give healthier environment on community daily life. More than 80 % diarrhea diseases are reduced in the last reported in November 2011. As the similar results, NRM projects as well completed environment conservation which terracing, fencing and reforest system which covered 5,7 Ha areas in 8 locations. The program performed well training and management for GMF members in 7 locations that enable community for maintaining the program post DWASH intervention. By the of December 2011, each GMF have collected low cost support from community with a total US$ 180.00 – 210.00 per each locations. For 9 months, Aplimentec has run DWASH program in integrated WASH-NRM projects. Lots of things have been learned. As NGO we can improve our initiatives to progress the program. It other way, we realized that there are many things need to be done in order to achieve more advantages for community as development targets. 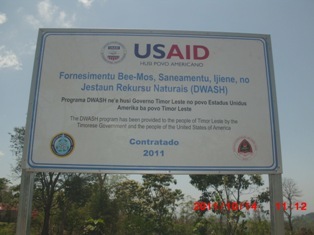 Aplimentec have informed that DWASH-USAID will be closing down its project by the end of January 2012.